Although it has not yet surfaced yet, a phone video of Toronto Mayor Rob Ford allegedly smoking crack cocaine exists. Staff of the Toronto Star has purportedly viewed it and feel it is authentic. The person possessing the video reportedly wants tens of thousands of dollars in exchange for the video. 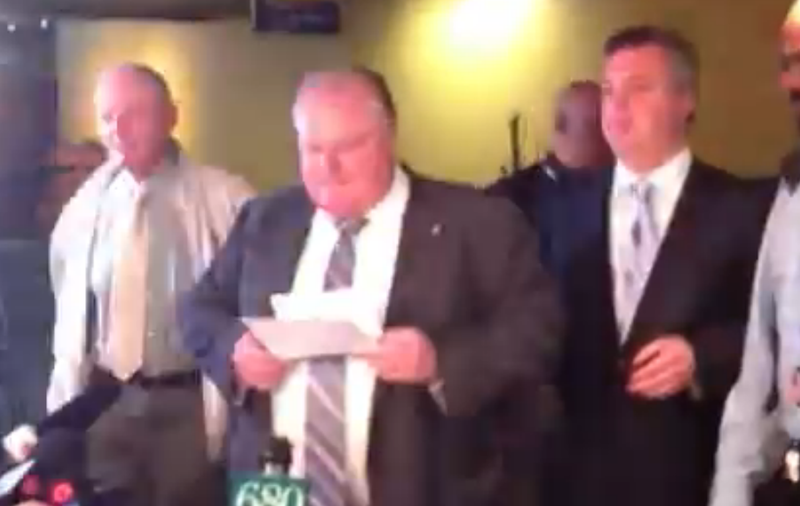 The video above shows Mayor Rob Ford denying the allegations. Regardless of whatever words the "script" or "memo" he is holding contains, no innocent man needs a script to declare his innocence. Deception needs to memorize. Truth speaks from the heart. From a nonverbal standpoint, his memo serves much the same function as a young child's blanket. It is a MAP surrogate (Manipulator, Adaptor, Pacifier) and is a strong signal of high anxiety in this context. MAP surrogates are slightly more refined forms of self-touching. His body language also betrays the lie as evidenced by the Mayor's relative lack of eye contact. Both in extended looking at his memo and prolonged looking down at noise on the floor provide subconscious excuses for looking away - and down - from his audience. We don't need to see the video. Rob Ford is guilty of smoking crack cocaine. What other nonverbal signals demonstrate Mr. Ford is lying? Asking for forgiveness? Frightened?